No need to worry, these top 4 kitchen trends are simple to install, and will give your space the much-needed upgrade it deserves. Whether used in the tile of a backsplash, as accents on appliances, or even on the exterior of cabinets, bold colors are one of the biggest kitchen trends this year. Warm shades like red and orange are popping up in contemporary homes, while hunter green is prominently featured in rustic remodels across the country. Requiring less upkeep and maintenance than popular granite styles, quartz countertops are becoming more and more popular across the Kansas City area. Simple in design, these shimmering styles are durable and versatile, helping other focal points of your space to shine. Gone are the days of boxy cooking areas down the hall from the main dining area. Instead, a trending feature for most kitchens is to now have an open layout that features both the kitchen and dining area in one. Social and sleek, this trend opens up your floor plan to new possibilities. From task lighting to ambient lighting and everything in-between, LED light bulbs are beginning to bring new life to kitchens across Kansas City. More efficient than fluorescent bulbs, LED lighting has evolved from its harsh past, and now features warm light perfect for your cooking and dining space. 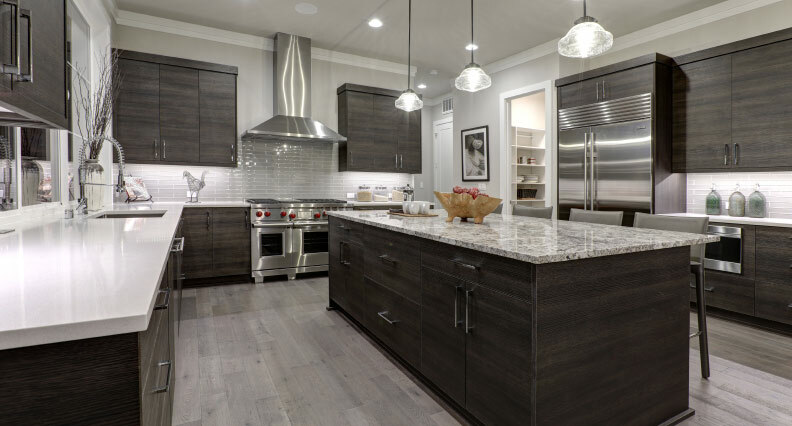 Whether you are looking to renovate your entire kitchen or simply spruce it up before guests arrive, Mission Kitchen and Bath can help you take advantage of the latest kitchen trends to give you the culinary space you’ve always dreamed of. To learn more or to start your own kitchen remodel visit Mission Kitchen and Bath today.